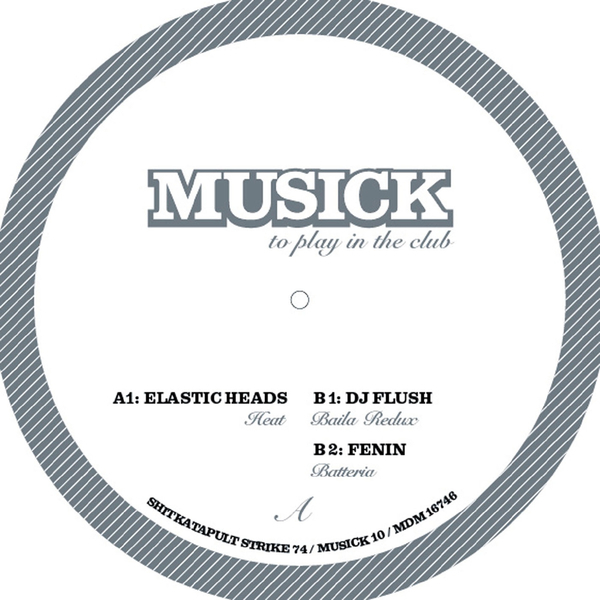 Marking their shuffle into double figures, the latest installment in Shitkatapult's 'Musick To Play In The Club' series hits volume ten with style - grafting in Elastic Heads, DJ Flush and Fenin to help dish out the jelly & ice-cream. Sandwiching the roughest cut between a couple of slink tech numbers, 'DJ Flush' presents a noir-tinged nigh flight through a rain lashed city, as thudding corporal beats collide with a batch of mangled mentalism - with both standing their ground for a wonderful chunk of digital tension. In contrast, the A from Elastic Heads is a squashed tech masterpiece with watercolour beats nestling against a rotating shimmer of chords, whilst Fenin's 'Batteria' is a similarly muted affair that consummately proves why less is more. Tenner!